Japanese Lawmaker's Baby Gets Booted From The Floor : Parallels When Yuka Ogata went back to work after having a baby, she tried to bring him along. The response highlighted the difficulties working women face in rules-bound Japan. 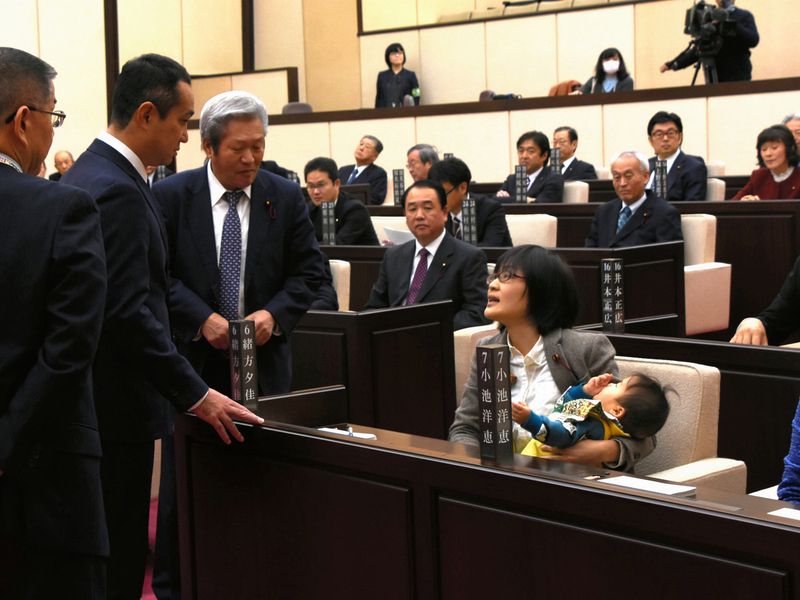 Lawmakers in the Kumamoto Municipal Assembly talk with member Yuka Ogata, who brought her infant son to work. When a municipal lawmaker, Yuka Ogata, brought her 7-month-old baby to her job in a male-dominated legislature, she was met with such surprise and consternation by her male colleagues that eventually, she and the baby were asked to leave. Officials of the Kumamoto Municipal Assembly, of which she's a member, said although there's no rule prohibiting infants, they booted her citing a rule that visitors are forbidden from the floor. It's a far different response by a legislative body than in Australia, where Sen. Larissa Waters was able to breast-feed her baby on the floor of Parliament. "Women cite factors pushing them out of the workplace, such as mata hara, harassment for getting pregnant or taking maternity leave. Women are disproportionately in part-time or casual work (see chart)—with worse pay, worse benefits and worse career prospects. They earn 74% of the median male wage on average, compared with 81% in America. "The disparity is especially stark at the highest ranks. Only two of Japan's 20 cabinet ministers are women. A woman cannot head the imperial family. No company on the Nikkei index has a female boss, an even poorer showing than the paltry seven on Britain's FTSE 100." Japanese women are working in bigger numbers these days — an estimated 68 percent of those ages 15 to 64 are employed or looking. And Prime Minister Shinzo Abe has pledged to boost women's economic opportunities in order to revive the slumping economy. But changing cultural mores about working moms is a far more difficult challenge. Freelance journalist Nathalie-Kyoko Stucky says Japanese society still expects men to work and women to give up working when they have children. Women who do not give up working have a difficult time of it — a condition Yuka Ogata wanted to emphasize on her first day back on the job since having her baby. "It was very hard for woman at work to find day care or nannies," Stucky says. "I myself sometimes had to attend meetings and interviews with my baby. The reaction of people, even in the Metro, when you take a baby in the stroller and you look like a working woman, it is like I am doing something offensive." NPR producer Melissa Gray contributed to this post.